Mission Im-pasta-able: Cook up some pasta at this fun and educational class with the Cornell Cooperative Extension! 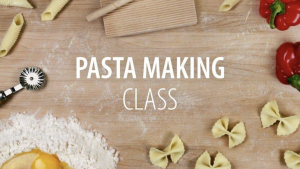 We’ll be learning to make our own pasta and then enjoying it together after. Cost will be $30 for STYP members and $40 for non-members and registration is due no later than April 10th, non-refundable after that date. The class is limited to 12 people in size so make sure you sign up early! Follow the link to sign up! Please feel free to bring snacks for during class and drinks for when we enjoy our pasta!